Aunty and I were on holiday recently for two weeks in North Wales, and would you believe it the weather is offering rain, gales and more rain! But we will not be daunted. On a small tidal island off the South West corner of Angelsey lies the ruins of an old church, Llandwyn. Even today it’s not easy to get to and requires a mile walk along the beach from the car park. Aunty striding along the beach towards Llandwyn Island. The island has a church dedicated to Dwynwen who lived during the 5th century AD and was one of 24 daughters of St. Brychan, a Welsh prince of Brycheiniog (Brecon). Legend has it she fell in love with young man named Maelon, but was forced to rejected his advances. Her father has decreed that she would marry someone else. Unhappy with her plight Dwynwen prayed to be released from the unhappy love and dreamed that she was given a potion to do this. However, the potion turned Maelon to ice. She then prayed that she be granted three wishes: 1) that Maelon be revived, 2) that all true lovers find happiness, and 3) that she should never again wish to be married. The remains of Llandwyn Chusrch, with the Twr Mawr Lighthouse behind. After this she fled her home and went away with her sister Cain and brother Dyfnan around Wales, preaching and establishing many Christian churches. 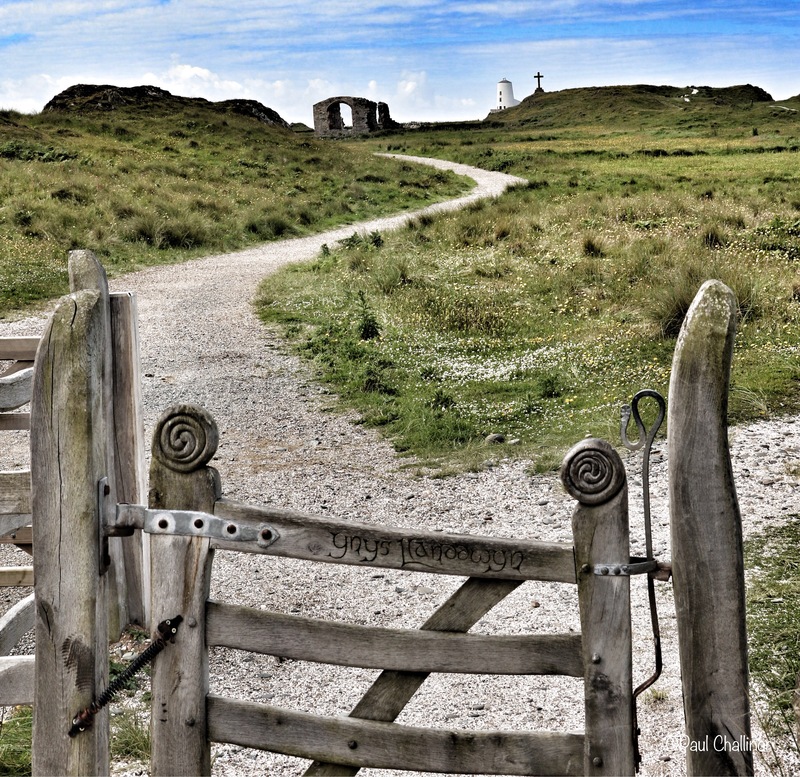 She founded a convent on Llanddwyn, where a well named after her became a place of pilgrimage after her death in 465AD. Dwynwen became known as the patron saint of lovers and pilgrimages were made to her holy well on the island. It was said that the faithfulness of a lover could be divined through the movements of eels that lived in the well. This was done by the woman first scattering breadcrumbs on the surface, then laying her handkerchief on the surface. If the eel disturbed it then her lover would be faithful. We looked hard for the well but couldn’t find it, but after 27 years of marriage we don’t have anything to prove to each other. Visitors would leave offerings at her shrine, and so popular was this place of pilgrimage that it became the richest in the area during Tudor times. This funded a substantial chapel that was built in the 16th century on the site of Dwynwen’s original chapel. In fact donations from pilgrims provided over nine-tenths of the church’s income in 1535. This all came to an end after King Henry VIII’s split with the Catholic Church, which put an end to pilgrimages and cut off the church’s main source of income. The main porch survived until the mid 1700s. Locals used to light candles here on the 25th April as an offering to Dwynwen to watch over their cattle. So when is St Dwynwen’s Day? On January 25th send your loved one a token of your love. Go on you know you want to! Many thanks again Pete. The weather was a but capricious and do a little post processing was needed. If you ever get the chance to visit do it early before everyone appears over the horizon!